Hamburg, Germany, 19 December 2017. A new study investigates the academic backgrounds of the Chief Executive Officers of the world’s largest companies. The survey by study choice portal Study.EU shows that 32% of the world’s top CEOs spent part of their university studies abroad, strongly exceeding the general average of around 6%. The survey looked at the CEOs of the largest public companies on each continent as per the Forbes Global 2000 company ranking. In total, the resumes of 231 CEOs were analysed. In past years, multiple studies have shown that diversity in the boardroom and across high-level management ranks increases the profitability of corporations (e.g. Peterson Institute & EY, McKinsey). The Chief Executive post, however, remains generally male-dominated: Only 3% of CEOs are women, all of them in the USA or in India. Meanwhile, 18% of CEOs are foreign nationals: With 43%, Australia has the highest share of foreign CEOs, mostly from New Zealand and the UK, followed by Europe with 36%. The data reveals a clear trend toward more international experience and diversity among CEOs: When looking only at the youngest third of the sample, the share of CEOs who studied abroad increases significantly to 41%, and the share of foreign nationals rises to 27%. This trend is expected to continue in the future, as student mobility in the general population has increased dramatically over the past decades (see OECD). That implies that future generations of CEOs are even more likely to have studied abroad than today’s top managers. 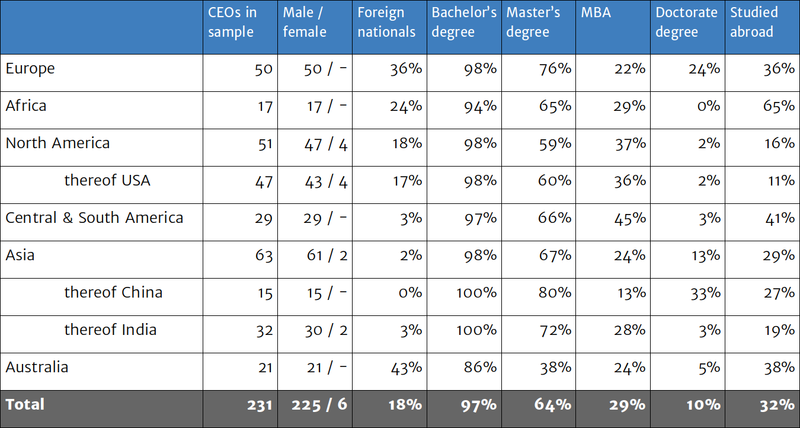 In this regard, US American companies may have to catch up: Only 11% of their CEOs have studied at university abroad, the lowest number for any region in the sample. Study.EU is the gateway to universities in Europe. As one of the leading information providers for study choice in Europe, it offers students information about more than 7,000 study programmes all over Europe. The Hamburg-based company connects students from around the world with European universities, enabling them to pursue the academic path they aspire. Study.EU closely cooperates with institutions of higher education as well as governmental organisations throughout Europe.